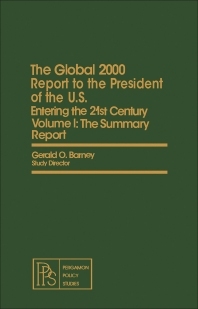 The Global 2000 Report to the President of the U.S.: Entering the 21st Century, Volume I: The Summary Report focuses on the Global 2000 Study, particularly noting the issues on the environment, population, and natural resources. The book first offers information on the findings and conclusions of the study and environment projections. Topics include water, energy, and forestry projections and the environment; climate changes and the environment; and gross national product (GNP) projections and the environment. The manuscript then examines the “Government's Global Model,“ including the analysis of the foundation, interpretation of projections, and strengthening the foundation. The text examines the elements of the ""Government's Global Model."" These include population, GNP, climate, technology, food, fisheries, forestry, water, energy, and fuel minerals. The book also surveys some of the studies and task forces whose findings might be helpful to those trying to provide methods and instructions in support of decision-making for international efforts in population, resources, and the environment. The manuscript will surely serve readers interested in the study of international efforts on population, resources, and the environment.